In addition to its many government services like NSO applications, PRC renewal of professional licenses, SSS and Pag-IBIG payments, and DTI Consumer Welfare Services, the SM Business Center now offers its customers Ombudsman Clearance Applications in 49 SM Malls nationwide beginning July 28. 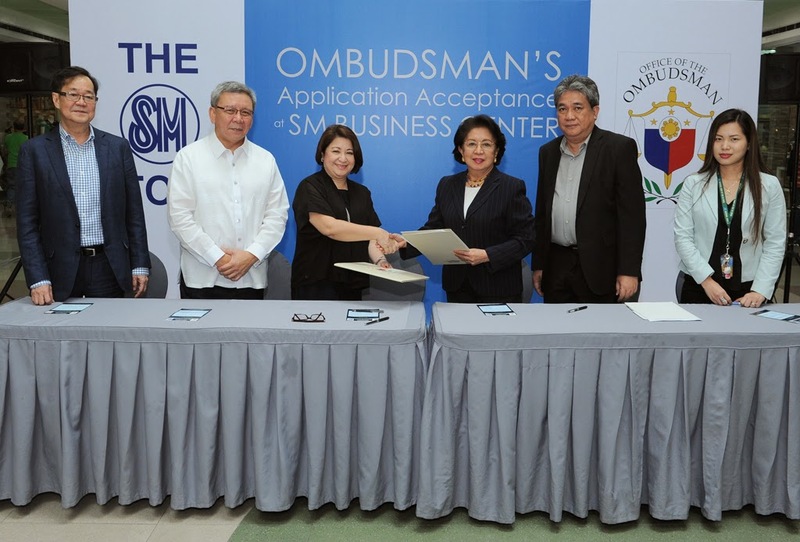 With that, SM Business Centers may now be able to receive applications and payments for Ombudsman Clearances. The Ombudsman Clearance is a document issued by the Office of the Ombudsman to certify that a particular person, especially a government employee, does not have any pending graft and corruption case filed against him/her. The Clearance is used for claiming of retirement benefits, promotion or transfer of office, travel abroad (especially those with hold departure orders or with similar names with people who have such), permit to carry firearms, and participation in government biddings. To formalize the partnership, SM Mart, Inc. recently signed a Memorandum of Agreement with the Office of the Ombudsman at SM City North EDSA. No less than Ombudsman Conchita Carpio-Morales and Overall Deputy Ombudsman Melchor Arthur Carandang graced the MOA signing together with SM Retail, Inc. President Jorge Mendiola, SM Retail, Inc. Senior Executive Vice President Ricky Lim, and SM Mart, Inc. President Chelo Monasterio. Deputy Ombudsman for the Military and Other Law Enforcement Offices Cyril Ramos and Atty. Joan Lou Gamboa, also from the Office of the Ombudsman were present together with SM Supermalls President Annie Garcia and SM Business Center Operations Senior Assistant Vice President Dennis Yaw. Application and payments can be filed at SM Business Centers, even on weekends and holidays. SM shall electronically transmit the data to the Office of the Ombudsman for printing of the clearance. The final clearance shall be picked up by Air21 and delivered directly to the customer. Over the past years, the SM Business Center has become a one-stop shop for government services so that customers can transact these requirements while shopping in the malls. Aside from the Ombudsman Clearance Applications, its services include NSO applications for birth, marriage, and death certificates; PRC renewals of professional licenses; and DTI consumer welfare services and renewal of business name. It also accepts payments for contributions and/or loans for the Social Security System, Pag-IBIG, PhilHealth, and the National Home Mortgage Finance Corporation. Apart from government services, the SM Business Center also accepts donations to the Red Cross and UNICEF, contributions for Couples for Christ, the reloading of Easytrip and e-Pass, and payments for ticket purchases with Philippine Airlines, Cebu Pacific, and Cathay Pacific. For more details visit SM Business Center at the second floor near cinema in SM City Marilao and at the ground floor near Watsons in SM City Baliwag.